Somebody at Burberry obviously saw the words “metallics are in” and just ran with it. This year’s collection is firmly fixed in the new controversial trend for SS13, but for those of us who meet the idea of metallic overcoats with some degree of trepidation, be not afraid. Burberry’s new Prorsum range manages to harness the metallic/neon theme of the year with class – but what else would you expect from Burberry? Now, some items in this collection are noticeably bold. But having inspected the range further it seems there is no better way to transition bold, avant garde style into wearable fashion then with a founding base of classic elegance and style – surely the epitome of Burberry’s product message. The Metallic Silk Trench and Caban coats are some of the more eye-catching numbers, and while this writer is slightly baffled at why Burberry would want to lose the slick lines of their classic and iconic coats – instead opting for what can only be described as the “scrunchyness” of the reflective metallic fabric – these pieces were designed to be bold, statement pieces, striving to be different: in this they have succeeded. It should be pointed out that I am far from decrying Burberry’s new range. Once we move past the offerings designed to provoke reaction, some truly incredible pieces are available. 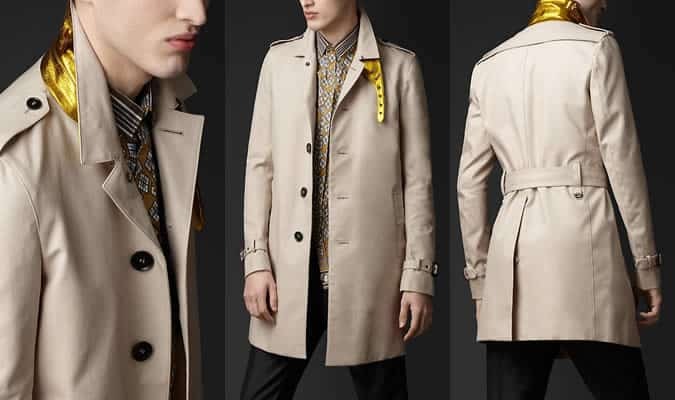 By far the most notable is the Metallic Undercollar Trench Coat, which manages to fuse Burberry’s renowned elegance with a blast of vibrant colour – the perfect retention of classic style with a flash of modern metal chic. In addition, there are various other designs boasting subtle shimmers of boldly coloured metallic silk. Advancing on from overcoats, a whole range of metallic bomber jackets have been developed, extending from bold metallics to muted purples and natural browns. Paired with black skinny jeans and plain shoes/boots the Bicolour Metallic Bomber Jackets will help create outfits that make an impact. To view the collection in its entirety head over to the Burberry website.